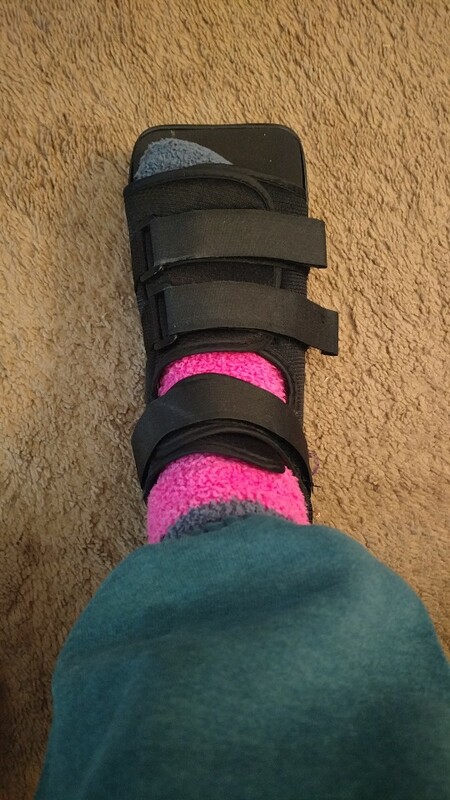 The day before Thanksgiving I fell at the dog park...well, actually one of my darling fur babies knocked me down, and when I fell I twisted my foot and ankle and landed on them. I went to the podiatrist for x-rays and nothing was broken. I tore all of the tendons and ligaments in my foot and ankle but no ruptures. 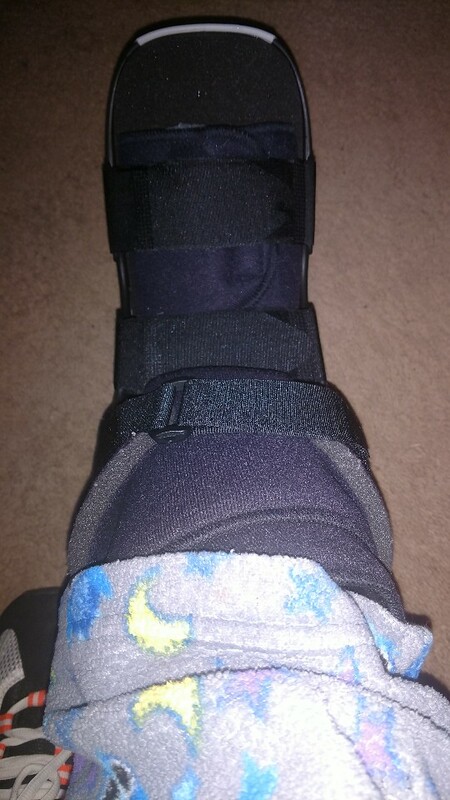 I'm wearing an orthopedic knee high boot outside and a hard sole hiking sandal or orthopedic shoe inside until it heals which could take up to six months. The doctor said it would have been better if it had been broken because bones heal faster than torn tendons and ligaments. He said that I could do easy rides on the NordicTrack stationary bike and I have been doing that by wearing the orthopedic shoe. I hope to be back on the hybrid on flat ground outside by April, if not before. My question is, can I ride the real bike while wearing the orthopedic shoe? Has anybody tried that? It has a hard rocker sole and is working fine on the stationary bike but I haven't tried it on the real bike. I don't think I'll be doing hills by April. The last thing I need to do is crash and mess the foot up again. I really hope I can ride in the hiking sandal by then but who knows. This whole recovery has been slow. This is the orthopedic shoe. Just ignore the ugly socks. LOL I have to wear thick socks to keep the heel of the shoe from moving since my feet are so thin. This is what I wear outside but no way I can ride in that. My question is, can I ride the real bike while wearing the orthopedic shoe? Has anybody tried that? It has a hard rocker sole and is working fine on the stationary bike but I haven't tried it on the real bike. I don't think I'll be doing hills by April. The last thing I need to do is crash and mess the foot up again. I really hope I can ride in the hiking sandal by then but who knows. This whole recovery has been slow. This is the orthopedic shoe. All you need is a flat pedal (MTB/hybrid) with no toe clips. You can pick up a cheap pair at any bike shop. You will have some leg-length differences due to the thickness of the sole on your boot, but unless you're wanting to do heavy miles, this won't be an issue. Based on my own experience, I urge you to ride as much as possible. It will greatly aid in healing by stimulating a lot more blood flow to the injured area. And the ability to exercise will keep your general health in better shape, which would otherwise be at risk due to the inactivity imposed by the injury. Riding the stationary bike does help loosen the foot. The doctor said to use the foot because the tendons and ligaments don't need to get stiff but only allow tolerable pain, no sharp pains or pain that doesn't stop. I walk pretty good in my sandals except for the flexibility in my big toe. It's almost like turf toe except that I can manually pull my toe back without pain but it hurts to bend it up with my ligaments or bend it up under weight. It's almost like tendonitis in that area. The pain is in the joint at the base of the toe. The pain and stiffness moves to a different spot day to day and even after two months of recovery the ankle is swollen by afternoon. The doctor said the main thing is DO NOT fall on it again or it could mean surgery. Discouraging. I agree with Kerry. Get back on the bike, dammit! I have never been this long without being on the bike. Withdrawal is bad! Do self-massage on the toe. I get that once in a while and all I have to do is massage the big toe joint (ball of the foot) for 30 seconds and the next day it feels much better. Are you doing PT yet? You may want to ask your PT or doctor about this rather than asking us here. My guess is if it doen't hurt, it's not doing damage. Don't work through pain. Is your current doc someone who specializes in sports medicine (a physiatrist)? They are the best docs for active people to go to. The problem with tendons and ligaments is they don't have much blood supply like bones do and therefore take much longer to heal. Been there, done that! First off, your injury sounds pretty serious. Perhaps you should be seeing an orthopedic surgeon who specializes in foot and ankle, not a podiatrist. The very last thing you want is to be treated by someone who is much less likely to have the full armamentarium of treatment modalities at his/her disposal in order to manage your injury. And let's face it... by and large, your average podiatrist is good for treating toenail fungus and plantar warts, not serious injuries of your foot. Trust me on this one.... you are in much better hands with an orthopedic surgeon for this. Second (and I'm no orthopedist), my understanding of these orthotic shoes is that they are designed to keep your foot flat, prevent it from bending, and limit tension on the injured hard and soft tissues in order to allow healing. If you are able to accomplish this while riding a bicycle, then great. Chances are, you will not be able to do this, and will prolong the injury or further injure your foot. I could be wrong, however, and that's why you need to see a proper specialist for this. If you are able to accomplish this while riding a bicycle, then great. Chances are, you will not be able to do this, and will prolong the injury or further injure your foot. I could be wrong, however, and that's why you need to see a proper specialist for this. Actually, chances are you WILL be able to do this. I rode for 2 weeks with an orthopedic boot, no problem. You're just wanting to stay on the bike, not set personal records. If it doesn't hurt, it's OK. I didn't at first catch that the OP went to a podiatrist. I would strongly agree not to have a podiatrist deal with serious issues like this. Keep in mind that podiatrists are not MD's. As Waspinator said, podiatrists are OK for treating corns, callouses, ingrown toenails, etc. For anything involving bones, tendons or ligaments, I would strongly suggest seeing an orthopedist or preferrably a sports medicine doctor (physiatrist). If it doesn’t hurt, it’s ok? Who on earth told you that? Not all injuries must hurt. And certainly, activities they can prolong injury needn’t hurt. Pain/soreness following the initial pain from injury is caused by the body’s inflammatory response, which makes the injured body part hypersensitive to stimuli. It’s referred to as “hyperalgesia”, and we experience it so that we protect the injured area. Once the inflammation is gone, the hyperalgesia typically subsides. Seriously, you think everyone with a broken bone uses the broken limb gingerly for the duration of the healing process? The pain from a broken bone is short-lived, but until the bone has fused, painless activity and tension on the bone can prolong or prevent healing. So your advice of “if it doesn’t hurt, you’re ok” is uninformed and unhelpful. ...my understanding of these orthotic shoes is that they are designed to keep your foot flat, prevent it from bending, and limit tension on the injured hard and soft tissues in order to allow healing. If you are able to accomplish this while riding a bicycle, then great. Chances are, you will not be able to do this, and will prolong the injury or further injure your foot. I could be wrong, however, and that's why you need to see a proper specialist for this. I'd say if the tendons don't continuously improve over the weeks, there's a problem; see a bone doctor. Nothing broke, so OP's ahead of the game. Agree with Kerry, ride the bike as soon as possible. Give the tendons 6 weeks of gentle coaching, then work gently as strength builds up. Yes, crashing would be a total bummer, but OP, you're not going to be smashing speed records, nor ramping up the miles. Short rides will stimulate the muscles and tendons just fine. I'd do longer rides when almost healed and feeling good, just in time for Spring. Getting the heart rate up, working the muscles, is great for recovery. Use it or lose it. The body can handle recovery superbly well being a long term cyclist. Fear not!! Waspinator has a point about form: gotta keep those tendons aligned, in place. So concentrate on a smooth stroke, careful to keep the leg from wobbling, if that's an issue. Also, why not wear the street shoes if they clear the crank arms? They'd be considerably more protective in a crash! Are you doing PT yet? This. WTF, OP? I broke my heel in a fall a while ago. Saw an ortho, who reviewed my MRIs and prescribed PT after the bone healed. Was non-weight-bearing for eight weeks. The PT managed my care thereafter and didn't want me exercising except under his supervision. I didn't tear any ligaments, but it took years for the pain to go away.